From left: Kylie McClanahan, Sarah Colpitts, Victoria Hobbs and Lauren Rainbolt. 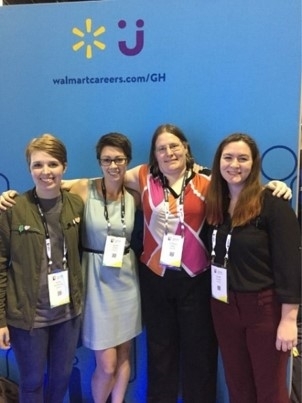 Four University of Arkansas students had the opportunity to attend the Grace Hopper Celebration this fall thanks to the generosity of Walmart. The Grace Hopper Celebration is the world's largest gathering of women technologists. The Grace Hopper Celebration is a three-day conference with the goal of bringing together women in computing to discuss research, career interests, and emerging technologies. The conference is named after Admiral Grace Murray Hopper, a computer programming pioneer whose work paved the way for some of the first compiler tools and programming languages. The four sponsored Computer Science and Computer Engineering students, all female, attended this exciting event from Oct. 4-6 in Orlando, Florida. While attending the Grace Hopper Celebration, the students were able to participate in a variety of professional development activities, not the least of which being a Career Expo with major companies such as Walmart, Google, Facebook, Amazon, and many others. There were numerous presentations on Emerging Technology, Artificial Intelligence, Cybersecurity, and Career Building. The students also had the opportunity to participate in hands-on workshops (i.e., one workshop introduced the inaugural Grace Hopper Capture the Flag Competition). Together, the four students were able to attend a talk by Melinda Gates and explore many activities that interested them personally. By sponsoring the students' attendance at this conference, Walmart aims to increase the number of students studying science, technology, engineering and math, the STEM disciplines at the University of Arkansas, and to address the STEM gender gap. Jessica Margetich, manager on Walmart's STEM strategy team, said, "I graduated with a STEM degree a few years back and had never attended or even heard of the GHC. Upon seeing it for myself, I was blown away by its incredible value; allowing students to understand current STEM market needs, interview for dream-worthy entry jobs, and learn from thousands of available, enthusiastic technologists. I am humbled to work for a company [Walmart] that is actively breaking down barriers to STEM-related fields and am very excited to further our GHC sponsorship program." Surrounded by 18,000 of their peers, they learned from and were exposed to women, companies, and ideas that would have been unavailable otherwise. Lauren Rainbolt, one of the sponsored students, said, "I encourage any woman who is in the technology field or interested in technology, to attend this conference. We are so grateful to Walmart for allowing us this opportunity. I am returning to the University of Arkansas empowered and excited to share what I've seen and learned." She also wrote about the experience, "Every person that I met had a different background and an exciting story. We don't all have the same path or the same interests, but technology connects us. There is a great need for more women technologists because together we are building a better world." Frank Liu, head of the Department of Computer Science and Computer Engineering, said, "The Computer Science and Computer Engineering Department encourages female students to study computing and data technology at the University of Arkansas. Opportunities like the Grace Hopper Celebration allow our female students to learn more about the world of technology and connect with their peers. We appreciate Walmart's generosity in sponsoring their attendance."